when Hubby is in the kitchen . . . 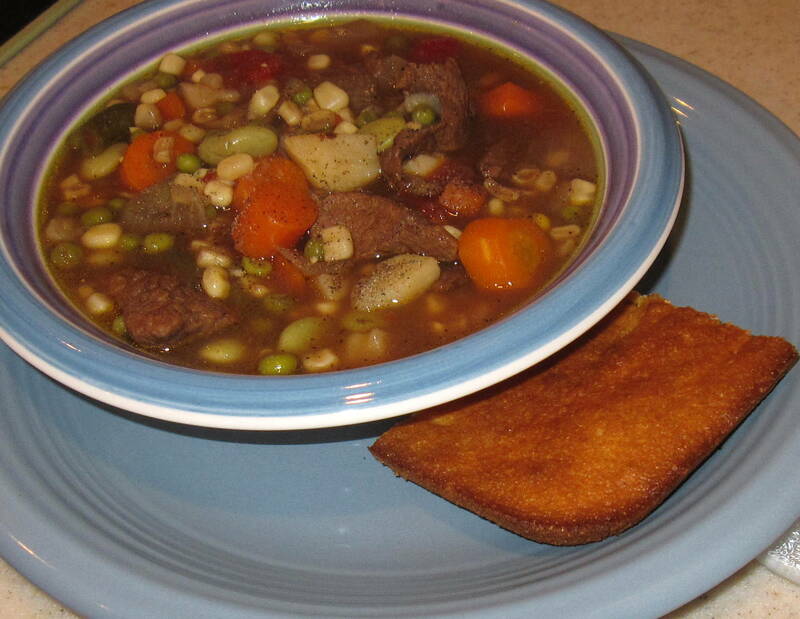 This is Stew and Cornbread Weather! why else would they call it Thanksgiving? As I was leaving the library this afternoon, met up with a friend who had been working on one of the library computers (just one of the services at our local library). The electrical storm yesterday ‘knocked out’ her computer. My arms were full of cookbooks when I told her that our oven was out of commission because of the electrical storm. Why the cookbooks? I think that I just love to read them – even though I might not be cooking! I never had it so good! I never had it so good . . .
We had such a hot hot HOT summer (into the fall, actually). 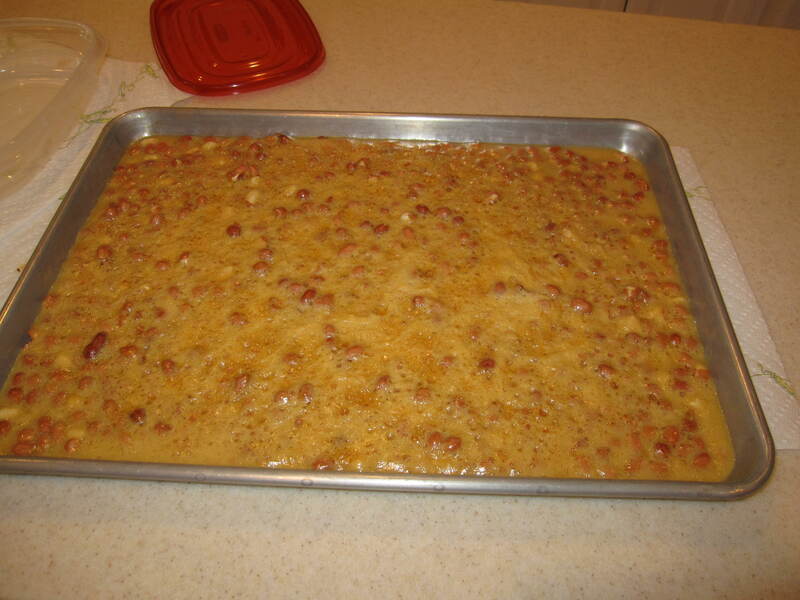 Now, the weather is getting cooler, and I’m thinking of hot chocolate, stew, Hubby making his famous Peanut Brittle, perhaps making a fruitcake (didn’t make one last year but we really enjoyed the Apricot Fruitcake in previous years), soups . . . . 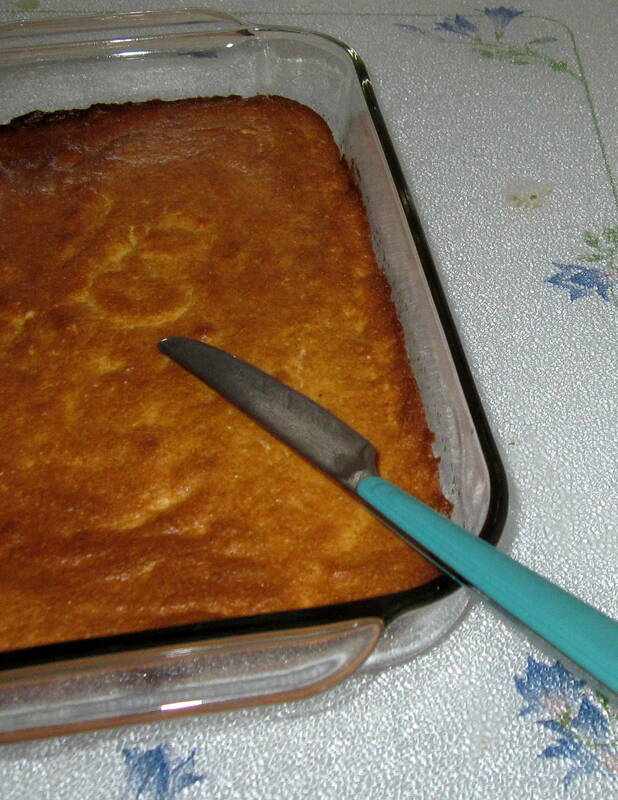 When my husband and I were first married, I had no experience in the kitchen. 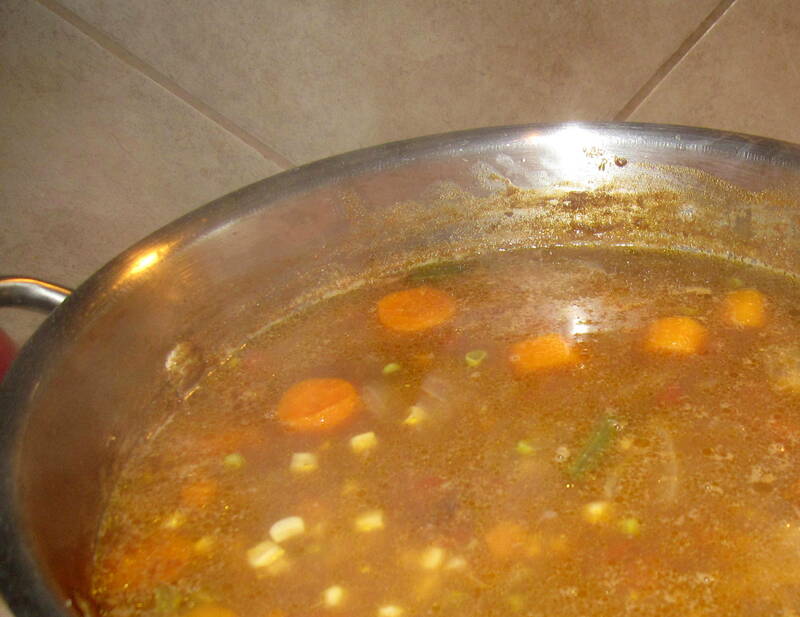 My mother (and aunts and grandmother) were marvelous cooks. And my mother did it all; I was rarely helping (except with the cleanup or table setting, etc). Now, I understand – for when I’m in the kitchen, I really want to ‘do my own thing’ and have no help (until I holler for Hubby to come chop or grate or slice something – bless his heart). However, I’m not enthusiastic about cooking when I have a dozen (or a hundred) other things/projects/commitments/obligations/duties. For when I’m in the kitchen, I want to be IN the kitchen and not rushing through the preparation in order to get to a meeting on time or finish a pressing project. Our oldest son has become an excellent and creative cook (which initially surprised me for I didn’t see this trait when he was younger!). Our youngest bachelor son is also a good cook. Our daughter is a very good cook. But like me – none of them did much cooking until they left the nest. in a few minutes - friends will be seated at this table - how grateful we are! NEVER NEVER NEVER lay a book facedown when open! DO NOT drop food or drink on the book you are reading! Gwen told Stuart everything important except why she was on the train. She was voluble in a way she couldn’t remember, and in a manner she couldn’t have been with someone her own age. She told him about the small family ranch between Mule Junction and Guthrie to which she had retreated after a brief, unhappy marriage to a university mathematician who now owned a computer business in Albuquerque; about the Cambodian girl they had adopted and she had raised to the current age of sixteen; about her love of flying and the old Cessna 172 she owned that was temporarily grounded in need of a valve job; of the Simmental-Charolais stud bull that was the ranch’s bread and butter, of her arthritic father who lived seventy miles away in Silver City because he needed dialysis twice a week, but always came to dinner on Sundays. She told him that her daughter, Sun by name, was precocious and had been recruited by colleges for early admission but had chosen to spend another year at home and graduate with her own class. Sun’s hobbies were botany, livestock and Indian history. “Maybe that’s because she’s Oriental and the Navajo and Apache are Athabascans who supposedly crossed the Bering Strait from Asia, then came on down here a thousand or so years ago,” Stuart suggested. Jim Harrison is one of my favorite writers. I never had it so good! ALL the menfolk cook! Grandson #2 makes Huevos Rancheros for breakfast! huevos rancheros - oh yes! young boy in the kitchen! The dishwasher got tired - we are resorting to plastic plates - but ohmy! the guys are cooking!